The Original WINDOM Antenna, with complete construction details! I had heard of the "Windom" and read a few articles about the Windom, but most of my thoughts were ... ho-hum.. just another dipole fed a bit off-center. Then one evening at a meeting of the GARC in the old "Sea Scouts" club house near the Coosa River in Gadsden, Alabama; I heard some of my "elmers" Gilbert Watson (SK) W4PAC, Gale Caudle (then W4CFB), Jack Kennamer (SK) W4YPC, Bob Bynum W4USM, Austin (Vic) Vickery, Walter Damkohler (SK) W4EBO, W4CWF, Ed Elkins (SK) W4CDI, Homer Dupree (SK) W4OZK, Jim Runyan, Homer O'Dell, Robert Martin, .... and others discussing the Windom all-band HF antenna. It was when Jack (W4YPC), mentioned using one (Windom) antenna, on the all HF bands that my ears went directional! That last phrase caught my undivided attention. "most all HF bands, ....etc" What ! A multi-band HF antenna ? Surely I had been blessed. To think that I could hang a Windom, and no longer have to climb the poles and trees to hang another (single band) HF antenna was great news to me. To be able to use it without an antenna tuner was icing-on-the-cake. For a kid without extra funds, an antenna tuner was a luxury that I could not afford. Even my transmitter was a single 807 rig I homebrewed on an old Atwater-Kent radio chassis, my grand-father had given me. In those days, a BALUN was unheard of. My Elmer's described, a means of connecting the coax to the off-center fed antenna using a nine (9) turn coil of the coax feed-line at the feed point. This coil of feedline coax formed a "de-coupling" loop. The de-coupling loop provided a crude means of matching the feed coax to the antenna, and at the same time, it would reduce the "re-radiation" (RF currents) along the outside (shield) of the feeder coax. 2) I've substituted a 4 to 1 BALUN for the 9 turn, 8 inch diameter, decoupling loop. Since writing this article a few decades ago for a major HAM radio magazine, I've received tons of mail (and eMail) asking for more information, especially with regards to a 160 meter version; Here then is "the rest of the story." First of all, we'll address the formula, and how to determine the length(s) of each section, using the same old formula that I used in 1949. Long Section; 468/1.8 MHz = 260 x .64 = 166.4 feet. Short Section; 468/1.8 MHz = 260 x .36 = 93.6 feet. For 75 thru 10 meters do similar math to arrive at/near the dimensions shown in the drawing below, but for best results, use the formula. The Windom can be installed as an inverted VEE, or as a sloper, but in no case, should the angle be less than 90 degrees against itself. To use an angle that folds against the pattern of the opposite end of the Windom, would change the impedance of the feed-point, change the multi-band features, and most important, destroy the radiation characteristics of the antenna. this Windom using coax, and a single balun, gives us the ability to construct it as an inverted VEE or at a "real estate saving (angle)" without destroying the features and performance of the Windom. This is not true with those antennas fed with ladder-lines and those that have several impedance transitions built into the feeders of the "basic" Windom....... There's more to come, so read on! Stainless eyebolt is inserted into Tenyte "Center Insulator" The "Center Insulator" is used to suspend the center of a Dipole, Windom, or other wire type antenna from tower, tree, or other support structure. 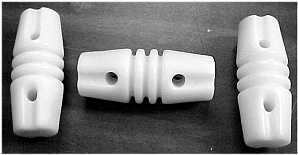 Weatherproof, (TENYTE) insulators. 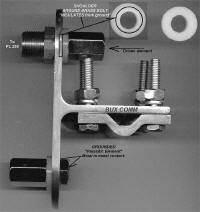 Perfect for your DIPOLE or Windom antenna. 33 ft dipole in my garage attic. One insulator at the center, and one each end. It's great for other HF WINDOM and single-band dipole antennas. Dielectric strength is comparable to the old ceramic insulators, without susceptibility to cracking or breakage under impact or extreme temperature changes. Now it's time for me to P O the wire and cable vendors, and the proponents of Windom's with too many feed-line transitions. Twin Lead, Ladder-line, Window Line..... etc.. is an over-kill with the Windom. If you must use Ladder-Line, then use the 450 Ohm ladder-line product that comprises poly-coated open wire substitute with "copper-clad steel conductors." It is much easier to handle than open wire feeder yet retains its ultra low loss feature. And trust me... It is NOT a problem of the ladder-line insulation quality or properties that I'm speaking of. I speak from experience; Wind will destroy the open type ladder-line. Again, "If you must use Ladder-Line, then use the 450 Ohm ladder-line product that comprises poly-coated wire with "copper-clad steel conductors." (see photo below) It is much easier to handle than open wire feeder yet retains its ultra low loss feature." IF; you decide to use ladder line, make one turn (twist) to each 20 to 24 inches of line to decrease the wind resistance presented by the "flat" line......... even if it is "window-slotted" type ladder-line. By adding the one twist per 20 inches, it may last longer than three years. Having been there, done that, and heard similar stories from others; another question arises regarding parallel line currents that come with the use of so-called balanced (twin-lead) feed-lines when used with the Windom antenna; The balanced line may also assume the properties of a single wire feeder (yuk). Some purveyors of the Windom that use ladder-line transitions, must use two impedance matchers (or BALUNS) with their (knock-off) Windom. One is to transition the coax outside the HAM shack (heaven forbid, we use ladder-line inside the shack... RF "feedback" in everything), to the ladder line, then another at the Windom (antenna) feed-point to choke off parallel current from the ladder-line. Since the (balanced) feed point of this antenna is found to be near 220 to 235 ohms, the use of a 4:1 BALUN to join our coax to the antenna, emerges as a compromising solution. Let's not lose sight of the most important advantage of using this antenna; and that is: It provides us with a powerful, multi-band antenna, and a minimum of feedline components. An antenna tuner is not out of the question, as it will provide an even better match between the transceiver and Windom, with less coupling loss and thus, greater transfer of energy (RF) to the antenna. I'm going to repeat this for the "perfectionists" among us: If you want to smooth out the hills and valleys on some of the bands then add your antenna tuner to the system, and the Windom becomes very flat across the bands. 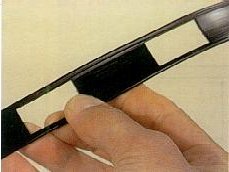 When I say "flat," we are talking about reducing the VSWR to a minimum, to produce a good forward power, transfer of RF energy to the Windom. The "Windom Antenna" was described by Loren G. Windom in QST magazine, September 1929. Pages 19 through 22. It is named after its inventor/designer. Loren Windom, W8GZ, was first to reveal the antenna to the radio amateur community by describing the antenna in the September 1929 issue of QST. It was by Windom's name that the antenna became known. 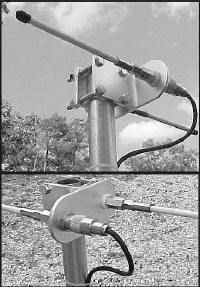 The Windom antenna is an off-center fed dipole with an unbalanced coax feedline. In 1937, the Windom was first described as a compromise multiband antenna. The antenna can be employed on 80, 40, 20 and 10m with considerable, though acceptable levels of VSWR. What became perhaps the most popular multiband Windom design of all, was the German-made Fritzel FD4 antenna, described by the late Dr. Fritz Spillner1, DJ2KY, in 1971. It had the same dimensions as the multiband Windom antenna, but fitted with a 200Ω (4:1) balun in its feedpoint and fed with coax. Today, many radio amateurs are using multiband Windom antennas with more than satisfactory results. It would not be without reason that Windom antennas are being employed during IARU HF World Championships! and most of all, by "high-stake-contests." Perhaps many young hams ignore the multiband Windom antenna because of its sheer simplicity and may be thinking it is too good to be true. The complexity of feeding other dipoles and doublets, the losses in dipoles with traps and the esoteric marketing of some other antennas seem to appeal to them more. CLICK HERE: and read more about the evolution of the WINDOM, to ZEPP, to VHF J-POLE. BUX BALUNs should be installed at the antenna feed point, or where the coax or feed-line attaches to the above ground antenna. 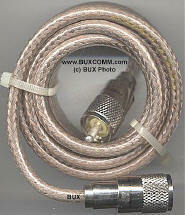 BUX BALUNs are used to connect balanced antennas to unbalanced transmission lines, such as coax cable. Their primary purpose is to prevent antenna (RF) currents from flowing down the outside of the cable. Another function of the BUX BALUN41 is to match the impedance of an unbalanced coax to the balanced feed point of a balanced input antenna(s). BUX BALUNS may also be used as “line isolators” anywhere along the cable to prevent the destructive influence of induced RF currents (VSWR). BUX 1:1 BALUNs are current BALUNs. They consist of several large, number 73, ferrite type 44 cores. BUX BALUN11 operate from 160 to 10mtr MHz and allow use of RF power to the rated capacity of the BALUN. BUX 4:1 BALUNs are voltage BALUNs. They consist of a large, number 43, ferrite dough-nut bobbin. BUX BALUN41 operate from 1.8 to 30 MHz MHz and allow use of RF power to the rated capacity of the BALUN. This is our BUX COMM High-Performance "HAMMER." We designed it to cope with a "wholesome" kilowatt... or two, or three. We decited that was NOT good enough, so we built it to endure harsh treatment. With an increase in local noise sources and the increasing attractiveness of long wire and dipole antennas, coax cable has become the antenna feed line of choice for most radio users and operators. Given that the impedance of most commonly available coax is either 50 or 72 ohms and since many wire antennas present an impedance of 200 to 600 ohms or more at the feed point, direct connection of the coax to wire antennas hits us with a significant signal loss due to the antenna impedance mismatch. Having realized this set of circumstances in the receiver and SWL arena, we're introducing a new approach to defeat the noise and impedance mismatch problems in our receive antennas by designing this new RxBALUN™. Our RxBALUN™ bridges the impedance gap, and enables an unbalance to balanced match between the antenna and our receivers. These features provide more signal transfer from the antenna to your receiver. Our RxBALUN will accommodate the SWL and QRP Operator. In addition, this RxBALUN may be employed as an antenna balun for both transmit and receive between the antenna and low powered transceivers running up to 200 watts. For input and output connectors, we use only the best Silver plated, Teflon®™ insulated, SO239 connectors. Max Power 250 watts.$14.97 RxBALUN Teflon ®™ E I DuPont corp. Rated above the legal power limit. Silver flashed, Teflon insulated, high temperature, wire. Output Connectors, tempered Brass Binding Posts. Bandwidth 160 - 10 m.
Insertion Loss, less than 1 dB. ANT202 is a Base Station, antenna for (HF) 20, 17, 15, 12, and 10 meters. We've also used it on 2 meters and 220 MHz with amazing success. This 450 Ohm ladder line comprises poly-coated open wire substitute with "copper-clad steel conductors." It is much easier to handle than open wire feeder yet retains its ultra low loss feature. This feedline will handle 1 kilowatt with ease and is far superior to the 300 Ohm ribbon type. makes it ideal for this application. PL-259 coax connectors are already installed on each end. 50 feet of RG-8U Low-Loss Base-Station Coaxial Cable. 100 feet of RG-8U Low-Loss Base-Station Coaxial Cable. At BUX COMM, *We don't cut corners! The components used in the manufacture of our BALUNs are of top quality components, beginning with the Silver Plate SO239 connectors and center insulator is made of teflon™(E.I Dupont). The wire we use to wind the ferrite donut is heavy-duty, silver flashed wire, with teflon™ insulation that will handle RF voltages above 5000 volts, and temperatures above 2000 degrees. The binding posts are heavy-duty, tempered brass, with end holes and side-thru holes to accommodate either type loop-thru connection. A double-shoulder brass capture nut is used to add a secure bite and improve antenna wire electrical connections. 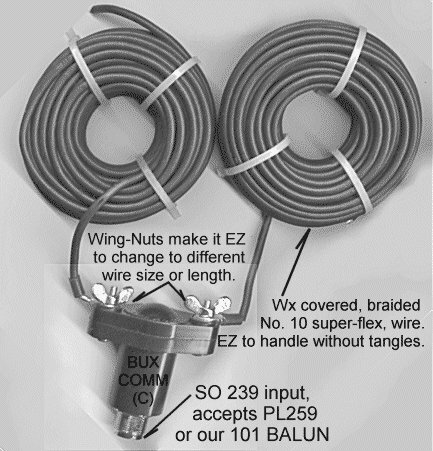 With our BUX UN UN (ONION), the coax is Belden™ and the PL259 connectors are Amphenol™. Toroid design, wound with teflon covered, silver plated wire. * Heavy-Duty, construction. SPECIAL This Month... !! BONUS SALE ! Buy either our 4:1 HD ⁭ or our 1:1 HD ↓ BALUN and receive "FREE," a Package of three Insulators, as shown above. BUX UN UN De-Coupling transformer, has SO-239 (female)input connector and output connector is 1 ft Mini 8 cable with PL-259 (male). BUX ONION is and UNbalanced to UNbalance (UN-UN) decoupling transformer designed to be used specifically with the DBLSPCL antenna. High RF currents traveling along the coax feed-line shield can cause high VSWR. 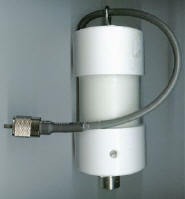 This decoupling transformer prevents RF currents from traveling down the outer shield of the coax. 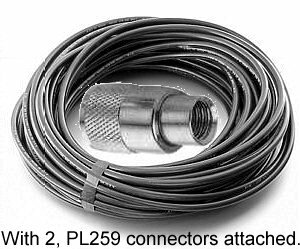 The input connector is an SO239 (female) and the output connector is a PL259 (male), which mates the connector of the "DBLSPCL" RV/Apartment dweller antenna shown above. Krusty Olde Kurt is now going to repeat himself. Why? Because the same question keeps coming up over and over. And he wants everyone to get it right. "I'm feeding my dipole with 600-ohm line. At the station end I need a balun to convert to 50-ohm coax. I need a 12:1 balun, right?" Wrong! A 4:1 balun would be better. Why is that? If your dipole is up, let's say, 35 feet then on 80 meters it will probably have a resistance at resonance of about 40 ohms. The actual resistance depends on the height above ground in wavelengths. If the dipole is 40 Ohms then what do you see at the transmitter end of your 600 ohm line? If the line is a half-wave long (120 ft on 80 Meters) you'll see 40 ohms. Remember, a half-wave line repeats what it sees at the other end. But if it is a quarter-wave long you'll see 8500 Ohms! At other line lengths you'll see impedances somewhere between these two extremes. So you are not going to see 450 ohms at the end of your 450-ohm line. That only happens if you have a 500-ohm antenna hooked onto it. With such a variation in impedance at the trans­mitter end of the line there is no one balun transformer that will match it. Most of the time the impedance will be above the 50 Ohms of your coax so a high impedance balun would be desirable. Unfortunately high imped­ance baluns don't work well when not matched. Experience has shown that 4:1 baluns work best in this service. They are more rugged and will take bad mismatches especially if they are wound on an iron powder core. So stop searching for that 12:1 balun. Use a 4:l BALUN and your system will work great. You can read Kurt N. Sterba “AERIALS” column in World Radio Magazine. BUX Master-Match™1:1 Baluns are ideal for Dipoles, Slopers, Inverted-Vees and center feed-point, RV antennas. They are also employed at the driven element of of many HF beams and Quads, and where feedpoint impedance is at, or near 50 ohms. By equalizing the currents in the antenna feeders, the Dipole pattern improves and prevents feedline (re)-radiation by preventing antenna currents flowing along the outer braid of the coax transmission line. Includes three FREE antenna insulators (shown elsewhere, this page). Our BUX Master-Match™4:1 Balun is ideal for matching windoms, web'd or folded dipoles, and antennas fed at a 250 ohm to 500 ohm impedance feedpoint with normal 50 or 75 ohm coax cable. In contrast to ordinary Baluns the BUX Master-Match™4:1 Balun support balanced currents in each leg of the antenna and prevents feedline (re)-radiation. As mentioned in our windom articles, feedlines and 450-ohm, brown, poly-covered ladder-line are easy to handle, and more-over they present another efficient means to feed multi-band antennas. We strongly suggest the use of our PolyCoat-Ladder-Line as it is made of strong, copper-clad, steel conductors. This light but durable, PolyCoat-Ladder-Line will far outlast the normal open copper with plastic spacers. (Includes three FREE antenna insulators, shown elsewhere, this page). The Got’cha is; These open type feedlines can bring high RF voltages into the shack. By using BUX Master-Match™4:1 Balun near the point where the transmission line enters the HAM shack, we impede that lip-bitting voltage and prevent excessive RF from getting into the PC, the transceiver, the telephone, the television (the XYL is watching) and heaven-forbid, the computer on her automatic washer. Heavy Duty 1" Nuts for the above bulkhead connectors. 50 Ohm impedance, 3 ft, 6 ft, 9 ft, 12 ft, & 18 feet. These jumpers are made from high quality, low-loss, coax cable with PL-259 connectors installed at each end. Need a High Quality jumper from your transceiver to the linear? A HiQuality coax jumper for that transceiver Output to linear input! The connectors are Amphenol™ and coax is RG-8X by Belden. Hi Quality, Six ft. (9') jumper made using high quality components. Reinforced, Double Bracket used with our "DBLSPCL" antennas shown elsewhere on this page. set of longer bolts for larger masts. Double Antenna Bracket as shown at left. Here's the perfect solution for your RV and portable HF antenna applications. Use our dipole, mast-mounted bracket for 'fixed-station', field-day operating, apartment dwellers, and the RV travelers. With two of the mobile HF antennas shown at left, you can have the best of both worlds. tuneable-tip antennas allow adjusting for minimum VSWR. CLICK HERE to read more about our HF DIPOLE SPECIAL! $ 39.97 DBLSPCL (without BALUN) With BALUN, see "DBLCOMBO", below.